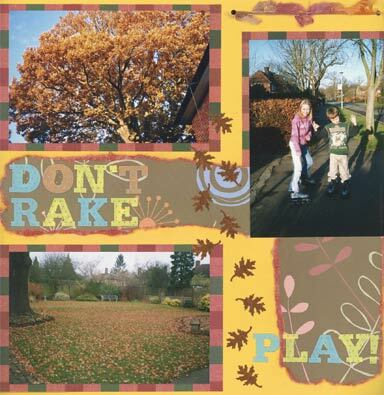 An Autumn scrapbook layout is a wonderful opportunity to use lovely rustic colours and textures. In fact your lonely, unused leaf punch has been crying out for an Autumn page. Go for it! This layout - apart from being another opportunity to feature my children - is my tribute to a 300-year-old oak tree in the garden. A spectacular golden canopy in October, it becomes a blister-inducing raking project in November! Sorry! Until I saw this I wasn't really a meticulous planner of page layouts - which is perhaps why some went straight in the trash. But a simple sketch template can work wonders for the final layout - so perhaps I could save on wastage! In '500 Scrapbooking Sketches' Jen Gormley shows us a great example of how a great layout can be born out of a sketch. You can see it here, about half way down this page. I wanted to 'drizzle' leaves from the top to the bottom photo to resemble the leaves' one way journey to the lawn. I used a Woodware Craft Collection leaf punch and bronze 'Art Textures' cardstock by Paper Adventures to achieve this. I'm fond of paper tearing because you can't very easily 'do it wrong'! However, for this page, I thought I'd quieten down the white edges of my Rob and Bob Design Studio paper with 'I'Kandee' chalk in 'Indian Red', applied with a cotton bud (one of those things we shouldn't scratch our ears with, however pleasurable). I found some textured thread by 'Eyelash' which I thought would finish off my layout nicely. I made two holes in my Bazzill Basics cardstock and simply threaded some through. The Karen Foster alphabet stickers have an attractive texture - which is not really visible on this scanned image. There are some fabulous papers and Autumn page kits around that will get any autumn scrapbook layout off to a flying start. Likewise you can get hold of a good variety of Autumn embellishments. If you'd like to dabble in digital scrapbook supply then you are also spoiled for choice.